Batgirl is taking a break from Burnside and jetting to Okinawa for some sight-seeing, soul-searching and some peace of mind. She's still the Barbara Gordon we know and love despite the change of creative teams but it's a wonderful respite in this new "Rebirth" era. 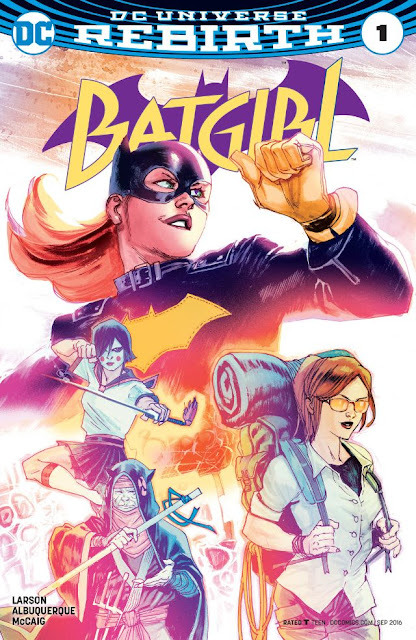 Batgirl #1 from Hope Larson, Rafael Albuquerque, and Dave McCaig is just as fun and well-conceived as the previous team of Cameron Stewart, Brenden Fletcher, and Babs Tarr. They molded a distinctive tone and appearance that the new team has embraced and made their own. As another restart to the series begins, they allow for a new adventure that references the past a little but mostly leaves it open for new readers to jump aboard without the burden of knowing the last run. Barbara is dropped into a new environment that's not only new to her but fresh for the reader. Refreshingly, she's not trying to appropriate anything from Japan but to simply observe and take in the sights as tourists do. If she happens to come across the 100-year old "Batgirl of Japan" while she's there so be it. She seems at ease being away from home, her corporation, her friends but finds an old friend at a hostel. Comfortably speaking Japanese and respecting her surroundings, Barbara seems at peace and her enthusiasm strikes an authentic tone. Albuquerque draws a joyful Barbara even when she's in Batgirl mode, nimble and confident. He adds his own distinctive touches to movement and to convey a memory of hers. Dave McCaig's radiant colors help accentuate the action and characters that pop off the page. It doesn't happen enough where a beloved character is shepherded into another set of capable hands that appreciate all that makes them special. DC Comics, to their credit, have given Batgirl the perfect team to carry on what you loved about the Batgirl of Burnside. Batgirl is still a must-read.